It’s one of my very favorite things about Leuven. Twice a week, two separate city squares are completely blocked off from traffic and filled with impromptu tent cities filled with, well, everything. Need some fruit? Well, if you need a pallet of it—TROIS EURO! Bread? Yeah, we got that. Fish? It’s on ice, just past the guy selling kitchen cleaning solutions. A five kilo wheel of edam cheese? Sure, if you can pick it out from the 90 other cheeses piled around it. Spiced olives? Nuts? Candy? Waffles? Used glasswares that a couple has obviously stolen from bars? Women’s underwear? Wait … what? Oh yeah. The market’s got that too. And though the prices may not be quite as good as can be found at the local grocery store every week, the value of market day’s ability to help shake up a diet and a Friday afternoon simultaneously can’t be overlooked. Other cities have got bigger, more hectic, but cheaper markets (Brussels daily flea market is a great one), but there the risk of getting older, lower quality fruit increases—to say nothing of your likelihood of being pickpocketed going through the roof. The best part of the market, though, is the connection you feel not just to the food, but to the people you’re buying from and around. The strange, spontaneous, but subtle excitement that comes from buying whatever your heart desires from a real live person—who actually freaking hands your purchases to you—can’t be denied. It doesn’t sound like a lot, but consider that once you’ve gotten to know a grocery store (a great feeling unto itself), you don’t have to speak to a single person until you’re prompted to pay. With self-pay, you don’t even have to do that anymore. The only moment you’re likely to touch another person during the whole experience is in the unlikely event that your hand brushes the cashier’s as you take your change. Follow the jump for more, plus cute puppies and unidentifiable, exotic fruit. The french fry, a time honored, never forgotten, but oft underappreciated side dish in America, finds new, or perhaps old, significance in Belgium. For that matter, it’s not even a “french fry” here; it’s simply a fry (frietje, in Flemish, frite in French). And by the way, don’t ever get caught calling a fry “French” here. Though under French control at the time, it’s widely believed that the “French Fry” was invented in Flemish Belgium (a place that is very much not French) in the 17th century. And they’ve got museums to prove it. 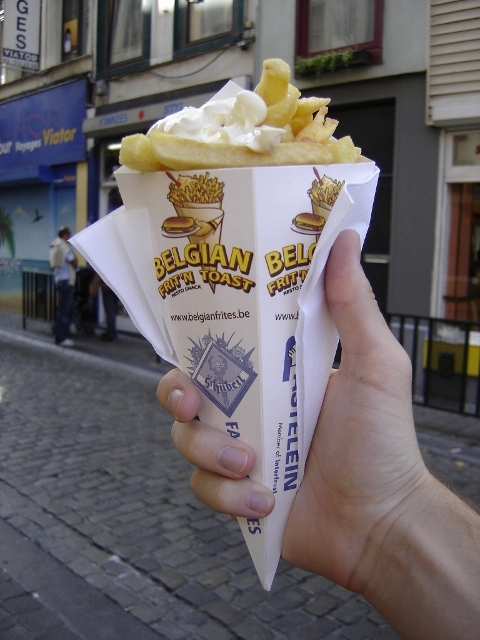 In both Antwerp and Bruges there are entire institutions dedicated to the chronicling, presentation, and exaltation of the frietje in its many forms. Fries have a different cultural significance here. Though many restaurants stateside do fries right (Café Lurçat and Convention Grill come to mind in The Cities, though the former is gourmet and the latter strictly diner, and it’s hard to beat U Burger in Boston), the normal restaurant and fast food fare would barely qualify as “fries” here. The sad mound of brown, fried starch you’ll receive at big chains and all-in-one family eateries will in no way prepare you for the frietje. Fries are an institution—a national snack time—and to fry them too much, too little, or too few times would be crime. Have I ever told you that cheese and crackers is my favorite food? Well cheese and crackers is my favorite food. This unfortunate realization came about after my high school graduation party–the leftover crackers and cheese from which it took me a whole week to polish off. I didn’t know that cheese and crackers were really my favorite food until all those toasted rectangles and all that dairy were gone. Not only was I not sick of cheese and crackers, I was sad that there weren’t more. Oh, dairy, you are a cruel mistress. For whatever reason, I find myself in a similar predicament now to the one I found myself in all those years ago. Sure, there’s plenty of cheese to be had in Belgium, but the cracker situation here is abysmal. The selection of crackers here is very small and very homogeneous. Rather than selecting the best possible cracker to match our cheeses, each week we seem to find ourselves choosing between the lesser of two wheat-thins. So I was elated to find these crispy, hidden gems early on. Mesdames et messieurs, I give you the Tosti’Croc. Not exactly a cracker, but close enough, these delicious little wafers (found in wheat or white varieties) are both economical and satisfying. With a texture akin to puffed rice cereal or thin cut cheetos poofs, the Tosti’Croc is ideal for snacking. And at just 1.25 for 1/8 lb (more than you really need), I find myself topping them with everything. 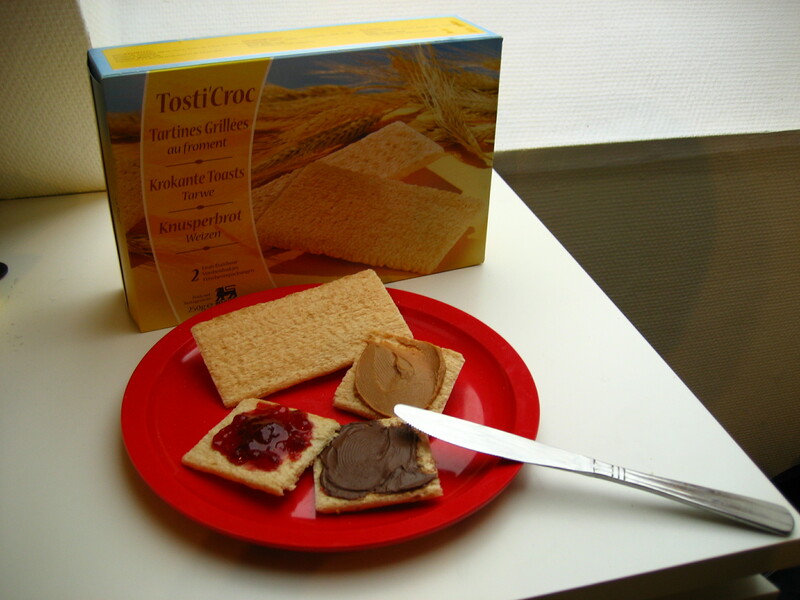 Stilton cheese, chevre, peanut butter (or at least the poor excuse that serves as peanut butter here in Europe), jam, or Nutella, I have become a Tosti’Croc fiend. Future Tosti’Croc related ideas include toasted Tosti’Crocs with oil and ground cayenne pepper, a Tosti-Croc-chos nacho plate, and Tosti’Croc crumb fried chicken. I love these damn things so much I could marry them (though Lindsey urges me not to do anything rash). Waffles are amazing. I was a waffle lover back home in the States and believe they are superior to pancakes in almost every way. However, in the U.S., the two aren’t really that different. I mean, it’s just the cooking method that differs most of the time, but really pancake batter and waffle batter are almost always comprised of the same ingredients, have the same basic texture and taste. Even still, the waffle iron at Towers Dining Hall served me well for 4 years of delicious waffle making with Rhett embossed right in the middle. However, these are no dining hall wannabe waffles. Oh no. Belgian waffles shouldn’t even be placed in the same category as “American” waffles. So just strike everything you think you know about waffles right now. Because these don’t look, smell, feel, sound, or taste like those impostor fluffy, pancakey things back home.